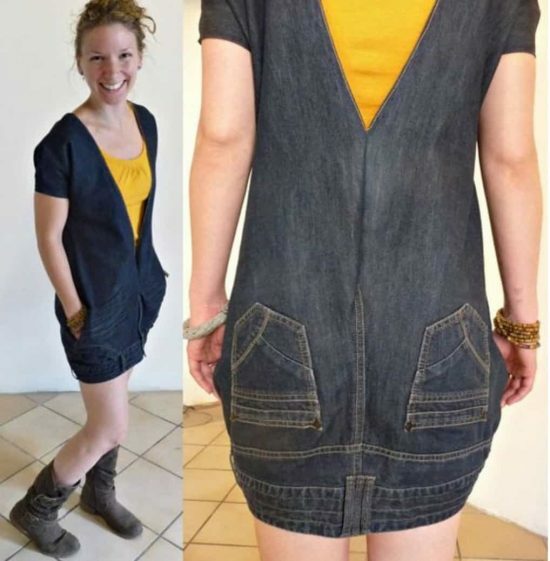 This Upside Down Jeans Dress Tutorial is an easy DIY you’ll love to try. You will love the results and it’s the perfect use for those old jeans you were about to throw out! What we love about denim jeans are all the fun things that you can upcycle them into. We’ve got all sorts of great projects floating around on our site including denim shorts, denim skirts, denim bags and more. We even have some adorable Denim Teddy Bears that have been very popular. You will be so surprised when you discover all the things that you can upcycle your jeans in to. Another favorite is the denim jeans planters. If you are looking for a fresh idea, we have found you one that you will love. 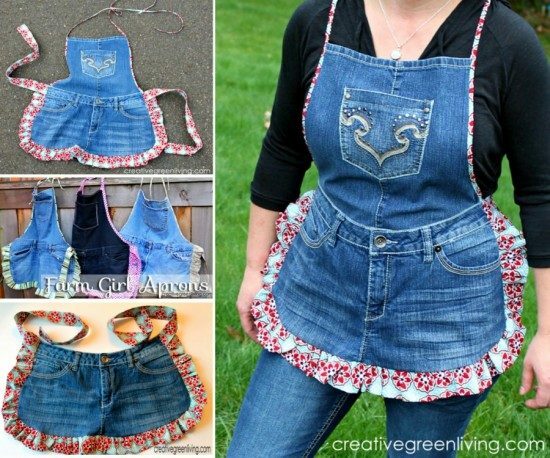 This DIY Upside Down Jeans Dress found on Etsy is super creative and a great design. You have to wonder who comes up with these ideas! It’s unique, to say the least! 1. Source your denim! For the dress in the video we used three pairs of jeans. 2. Take one pair of jeans. On the back, cut up the inside leg seam. Cut open the crotch to the bottom of the fly. 3. Lie flat on the table. There is a large ‘V’ between the two legs. 4. From another pair of jeans, cut off one leg and again, cut open up the inside leg seam. 5. Lie flat and position under the other pair of jeans to fill in the ‘V’ area. 6. Pin and sew in place. Turnover and cut away any excess fabric. 7. Mark line to cut away front and back; start from front pockets and draw around towards the back coming below the pockets. 8. Place on mannequin or body and pin in at the centre back to get fit right. 9. Cut off waist bands from two pairs of jeans and pin in place for shoulder straps. 10. Having pinned in at the back, remove dress from mannequin and cut away excess remembering to leave a seam allowance. 11. Insert zip and sew new centre back seam. Sew straps in place. 12. Check length and cut to desired length. Be careful – once cut, there’s no going back! The photos don’t show off the full potential of this dress. Firstly, you are more likely to wear a longer sleeve under the dress. Imagine a black long sleeve top over tights or leggings with boots. It will be a lovely piece for casual wear. All you need for this project is a pair of old jeans, some scissors, needle and thread and a sewing machine. You can find the full details at the following link. We have also included some other ideas in our post so be sure that you scroll our page all the way to the end. As always, Pin your favorites. Begin by unpicking the inside seam of your denim jeans. This should include the one that is the crotch junction. Next, using your scissors cut along the area that would cover between your legs if wearing the jeans. Unpick the seams, from base to crotch, until you create an armpit for your dress. Pop your jeans on like a dress using the picture as a guide. Fix with pins and then sew up your new seams. The pattern and photos provide the best resource. Pop your jeans on like a dress using the picture as a guide. Fix with pins and then sew up your new seams. The pattern and photos provide the best resource.